Home / Research / Science news / Scientific artifacts / Researchers develop polymers that can mimic chameleon skin. Researchers develop polymers that can mimic chameleon skin. Biological tissues have very complex mechanical properties that are difficult to reproduce using synthetic materials. An international team has been able to produce a very bio compatible synthetic material that do replicates tissue mechanics and alters color when it changes shape, just like chameleon skin. These results, to which have contributed with colleagues in the US (University of North Carolina at Chapel Hill, University of Akron), are published on March 30, 2018 in Science. This current research has left a promise for new materials for biomedical devices. According to researchers from CNRS, Universite de Haute-Alsace(1) and ESRF, the European Synchrotron, to produce a medical implant, they need to select materials with very similar mechanical properties to those in biological tissues, so as to mitigate inflammation or necrosis. A number of tissues including the skin, the intestinal wall, and the heart muscle, have the particularity of being soft yet stiffening when they are stretched. Until now, it has been impossible to reproduce this behavior with synthetic materials. The researchers have attempted to achieve this with a unique triblock copolymer . They have synthesized a physically cross-linked elastomer composed of a central block onto which side chains are grafted (like a bottle brush) and with linear terminal blocks at each end. The researchers have found that by carefully selecting the polymer's structural parameters, the material followed the same strain curve as a biological tissue, in this case pig skin. It is also biocompatible, since it does not require additives, e.g. solvent, and remains stable in the presence of biological fluids. Atomic force microscopy and X-ray diffraction experiments have shown that the terminal blocks of these polymers assemble in nanometer spheres, distributed in a brush-polymer matrix. Light interferes with this microphase-separated structure to produce color according to the distance between the spheres; so when the material is stretched it changes color. It is the same mechanism that explains in large part how chameleons change color. 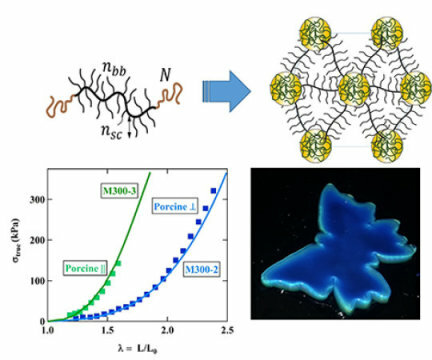 The researchers have therefore succeeded in encoding in a unique synthetic polymer both mechanical properties (flexibility, strain profile) and optical properties, which had never previously been achieved. By adjusting the length or density of the "brush's" various side chains, these properties can be modulated. This discovery could lead to medical implants or more personalized prostheses (vascular implants, intraocular implants, replacement of intervertebral discs), and also to materials with completely new strain profiles, and applications that have not yet been imagined.